Ascarrii, it looks like you didn't install it properly. You must install version 0.972, then install the 0.973 patch on top of that, then install the 0.974 patch on top of that. This may be a catalog error : B1957+20 is 5 ly from the sun ! yepp....now! in the last Version of SE 0.9.7.4.7 all works fine...... FPS by 18... now in 0.9.7.4.8 FPS 1.6. Can anyone tell me why? or is that a bug? its an betaversion (i know).... please help! You're lucky patch 8 works at all on Intel HD, Major Tom! I have an Intel I3 laptop with an Intel HD 4000 card that generally gives my aging desktop a run for its money, but it won't run patch 7 or 8 at all. From my discussions with the good Doctor and Harbinger, I think it's the new depth buffer. Just a brief problem report. SE (maybe ever since 0.97) sometimes has trouble generating proper orbits for binary systems. 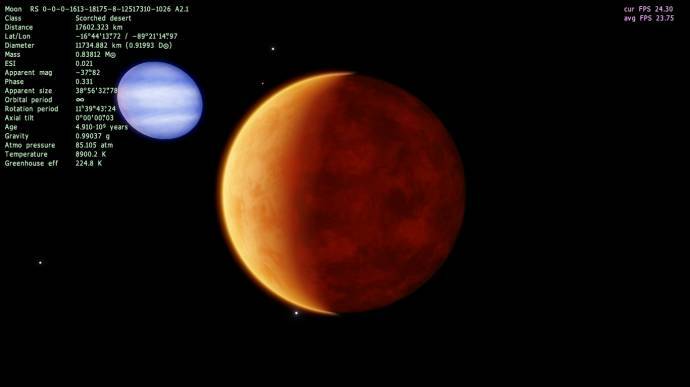 For instance, in a bookmark named "System with triple brown dwarf" ("RS 8410-2-8-10916854-264") in the patch 8, B has greater semimajor axis length than A. However, one can also clearly see that B (a white dwarf system) has greater sum mass than A (A pair of M and T dwarves). I found an interesting bug to say the least. Some moons will generate in hyperbolic orbits causing them to pass through the host planet and eject from the star system. Highly amusing. well i got patch 08 to work, sorry for pestering you guys about it. - The Core i3 is probably giving you more grief than the HD Graphics 4000. I have HD Graphics 4000, but with a Core i7, and aside from laggy terrain loading and auroras (which it seems everyone has), SE runs great. - Intel HD Graphics is indeed incompatible with the new depth buffer, but you can switch it back to a standard depth buffer using DepthBufferMode 0 in main.cfg. Thanks - I knew about the main.cfg trick, but I hadn't bothered, since patch 7 auto-overrides any such change, and patch 8, well, I figured that would break the new accretion disks - though it might be interesting to see how they break! As for the I3, it's performed admirably on every iteration up to patch 7 - and quite smoothly, too, once I applied a few tweaks from the troubleshooting threads. I seem to be having trouble with the latest patch. 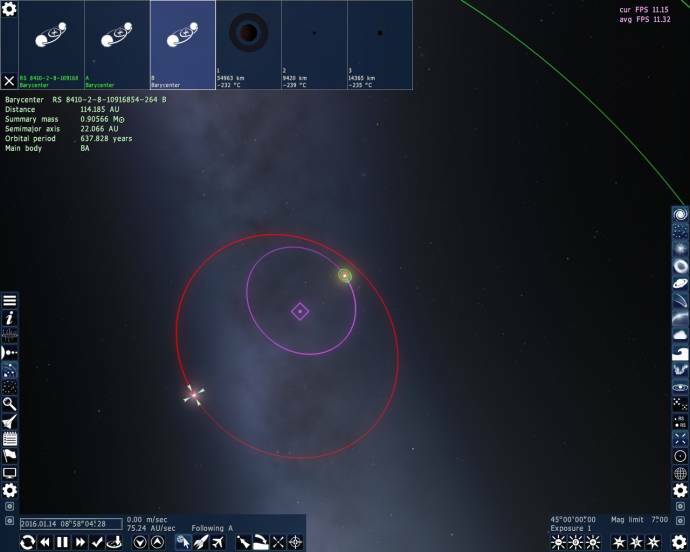 It crashes immediately upon attempting to exit the menu (clicking Planetarium) and simply displays "A problem has caused SpaceEngine to stop working. Please close the program." Notably, the surface of whatever planet the default starting place disappears after around two or three seconds, before the program fails. I can run 9.7.2 without issue (apart from the occasional graphical bug here and there). Attached is the log; skimming it I saw no major errors, but maybe there's something there I'm not seeing. I thought it was perhaps a problem with the processor not being able to handle the graphics, but even after lowering several of the planet detail graphics, the problem persists. I attached the config file so that perhaps you can see what I've attempted to do. And yes, I have cleared the cache. For some reason there is no texture on Pluto and Charon, how do i fix it? I simply forgot to include them (as well as Ceres). More precisely, I didn't work on new Pluto, Charon and Ceres textures for SE yet. I just tested few mods made by someone many months ago, and occasionally include Solar system catalog with modded Pluto and Charon in this patch. Just look for mods on this and Russian forum and install them. This looks like broken installation. SE even didn't find texture for that loading window. Check your installation. Spaceengineer, I have a question regarding the accretion disks. I've noticed that the accretion disks look different in the development pictures. The ones in the pictures look more cloudy and get more wispy at the center...but in the patch release they look stretched like rings around a planet. Why is this? Or maybe it's just the ones I saw, maybe there are different textures? Also, are they animated? When I was studying Sagittarius *A, I think I saw the accretion disk change. Am I wrong? Or are they animated? Regarding rotation speed, it has been explained here many times. Look at the black hole radius and keep in mind what matter in the inner parts of the disk moves at ~0.6c speed. Now you must be able to estimate rotation period and so pattern change speed. In short: use SE time flow controls. Is it possible to disable/enable the shipwarp effect with a console command? Earlier in this thread, I posted about a long-standing "jump" bug. I mention it because during my travels, I decided to investigate one of them, and I noticed it seems to be due to extremely thin, invisible wals, of varying heights it seems, at the edges of some procedural tiles. Does anyone know what causes these "invisible walls"? I know. Bug in collision detection algorithm. You can't fix it. The new gravitational lensing in 0.9.7.4 patch-08 disappointing. When I go close to a black hole, I see a very large area of "black". As I get closer, the black area get larger. Finally at the horizon the scene is full of black. However, the scene is not true. In fact, when you fall into a Schwarzschild black hole or a Reissner-Nordström black hole, you never meet the scene full of black - what's more, you never meet the scene with more than a half of black! This one shows a more realistic scene when you fall into a R-N black hole - you'll be vaporized at the inner horizon, but you feel nothing special at the outer horizon. Most real black holes are Kerr black hole, and they also have outer horizon and inner horizon. So the scene when you fall into them is similar to the R-N one - you feel nothing special at the outer horizon but be vaporized at the inner horizon. I noticed earlier what SE now models only a Schwarzschild black hole and only for a stationary observer. If I were to implement moving observer, the effects shown on that videos will be visible, but I also must limit camera speed to speed of light. This simply have no sense in planetarium, because camera is free and can be moved at any speed. The issue probably can be solved by consider camera movement by user as instant teleportation, instead of physical movement. What's this weird green thing? Lol it looked like a tiny planetary nebula around giant black hole. Can you share a location of that place? Not all BH's have this issue. I can approach others and they look normal. The issue persists with Hi-quality black holes turned on AND off. What is your computer specs? I saw this issue on Intel graphics card, and fixed it. Probably not completely.